The Crowborough & District Chamber Of Commerce is a group for all businesses. We provide a forum for sharing ideas and working together as well as organising events to help raise the profile of Crowborough & District. 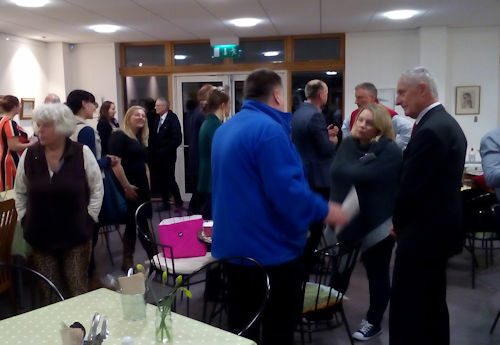 Our Chamber Meetings and Networking Events are friendly, informal gatherings where people can meet, socialise and make business contacts in a no pressure environment. Membership of the Crowborough & District Chamber Of Commerce is subject to an annual membership fee. All businesses are encouraged to join in, from the one-man band operating from home to larger local and national businesses. If you have any questions about how the Chamber helps business, how to join, events that we organise, suggestions or would like to get involved with The Crowborough and District Chamber of Commerce simply contact us. Crowborough Rugby Club, 5.45 pm for a 6.30 pm start. Please inform the Secretary if you wish to attend. Millbrook Garden Centre Café, 7.45 am until 8.45 am. Open to both members and non members, non members will be charged £5. To register for the next meeting please contact us by 2nd May. Join your fellow Chamber members from across Wealden; Crowborough, Hailsham, Heathfield & Uckfield for a summer BBQ. Members only £8.00, please contact the Secretary to book. Crowborough Community Centre, 6.00pm start. • To promote and protect the commercial, retail, professional and general interests of all business sectors in Crowborough and district. • To discuss, represent and promote measures calculated to benefit the business interests of Crowborough and district. • To promote friendly and collaborative relations among all persons interested in the commercial welfare of the area. • To make known by advertising, or other means of publicity, the advantages of Crowborough as a commercial and residential Town, tourist area and business centre for North Wealden. • To promote advertising and social functions by which publicity may be obtained for the area through the press and other channels. • To support charitable fund raising activities where considered appropriate to the intent of the Chamber and to the interests and well being of the district and its inhabitants. • To discuss and deal with all matters (non-political and non-sectarian) arising relative to local affairs but particularly to the local economy. • To actively contribute towards the aims of the Association of Chambers in East Sussex (ACES).